A year ago, a project to regenerate four run-down Liverpool streets won the Turner Prize - normally the preserve of the art elite. As well as shaking up the art establishment, the victory brought the winning area impetus, pride, attention - and tension. When Sumuyya Khader was five years old, her mother let her walk the short way from her house to Sam's newsagents on her own. "It was two minutes away from where I lived," Ms Khader recalls. "So I was allowed to potter around. You knew everyone." Twenty-three years later, the newsagent is boarded up - like a number of houses on the road. But Ms Khader has returned. She came back to Cairns Street in Toxteth last year to be operations manager for Granby Workshop, a cottage industry that was set up to capitalise on the spotlight the Turner Prize put on the area. 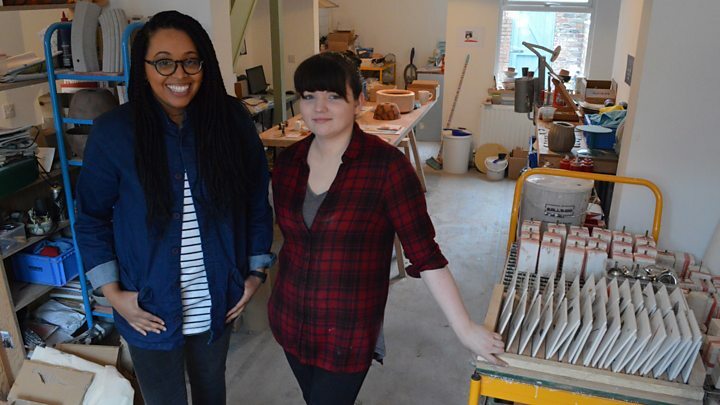 Inside, Ms Khader and Jade Crompton, 25, craft terracotta lampshades and bespoke bathroom tiles and ceramic handles, which were originally designed for the houses in the Turner Prize-winning regeneration scheme and which are now being sold to the wider world. The workshop is temporarily based in one of the empty terraced houses on Cairns Street, but in the new year it will to a permanent home - the old newsagent. "Part of the reason I was so keen to get involved is I knew it as Sam's newsagents," Ms Khader says. "With living down the road when I was a kid, it was something I was interested in straight away. I wanted to be involved in something creative and giving back to this area." A year after the Turner Prize win, Granby Workshop is taking orders from around the UK as well as countries ranging from Switzerland to Japan. The workshop is "the number one achievement" since the Turner Prize win, according to Lewis Jones from design collective Assemble. Assemble were awarded the prestigious prize for their collaboration with the Granby Four Streets Community Land Trust (CLT) - a group of residents who have fought for years to bring the area back from dereliction. "It's a way of directing that attention and publicity into something that could continue to benefit the neighbourhood," Mr Jones says of the workshop. "People from all over the world are placing orders for products and that helps everything here." Down the road from the workshop is a row of three houses with doors painted different colours - yellow, blue and orange. Five houses renovated by Assemble have already been rented out, but these three are the first to be sold. They are empty as they await their new owners. Assemble's fireplaces - made using brick, slate and stone that was reclaimed from the houses themselves - are visible through the curtainless windows. But the fact that these houses contain Turner Prize-winning designs has not been used to push up the prices. In fact, the CLT has deliberately sold them below market value. "We don't want them to become 'Turner houses', if you know what I mean," says Granby CLT chair Erika Rushton. "Because we want local people to live in them forever." In fact, priority has been given to those with a connection to the area, either themselves or through family, and who can afford the £90,000 asking price but would struggle to buy something on the open market. The average house price in Liverpool is £121,000. Once they have bought it, the deeds also say they cannot sell the house on for a big profit - it must always be sold below market value, as calculated using the average Liverpool wage. Next door to the Granby Workshop, a house is boarded up and a notice pasted to the door informs passers-by that anything of value has been removed. On the other side, green hoardings surround the next two houses. These were initially earmarked for habitation but have since been deemed uninhabitable - one has no roof. So instead of being brought back to life as houses, work is starting any day now to turn them into a winter garden, with a glazed roof and rampant greenery. Assemble came up with the idea after peering through the grill of a derelict house on a neighbouring street to see the front room being reclaimed by nature. "It's really important to recognise what they [Assemble] did for the Turner Prize," says CLT vice-chair Hazel Tilley, 61, who has lived on Cairns Street for 25 years. "They brought ordinary people into focus. It's a major political piece of art, I think, and it's beautifully done. "It deserves more than the Turner Prize because what their art has done is it's helped to restore - not pride because we always had pride in our area - but our faith. These young people didn't know what couldn't be done, so they did it. "Twelve months on, we've got the investment for the winter garden because of the Turner Prize. The winter garden is the most amazing, incredible thing and it will be four doors away from me. It's such a beautiful, beautiful idea." Unlike the stereotypical Turner Prize trend-setter of yesteryear, Assemble do not appear to be in it for the notoriety or the money. "They're still not rich," Mrs Tilley adds. "They don't work in a way that makes money. They work in a way that makes a difference. And that is the true calling of the artist. I have such a lot of respect for them and quite a lot of love for them." The next major project may prove to be two roads down - Ducie Street, where every single house is empty and every window and door has been boarded or bricked up. Since the Turner nomination, every house has been decorated with colourful murals - nothing to do with the official Turner project, but they deserve a prize of their own. Around the corner, one critic has daubed the words "arty farty" on a brick wall. Some locals have clearly watched the Turner whirlwind with a large dose of irreverent scepticism. Assemble and the Granby CLT have still only renovated eight houses over the four streets, with a possible five more pencilled in for now. Many more properties have been done up by the council, housing associations and private individuals, while others are still rotting. The attention from the Turner Prize "brought stresses and strains as well as good things", Ms Rushton admits. "It would be honest to say that. Some people really advantaged from that profile and publicity and not everybody did. So there were not exactly winners and losers, but that brought some tensions I think." One year on, however, the experience has been good for the area as a whole, she believes. "Historically, Toxteth had a really negative name because it once had a riot many moons ago," she says. "And the Turner Prize has transformed a negative story into a positive story. It's done a good thing for us there."